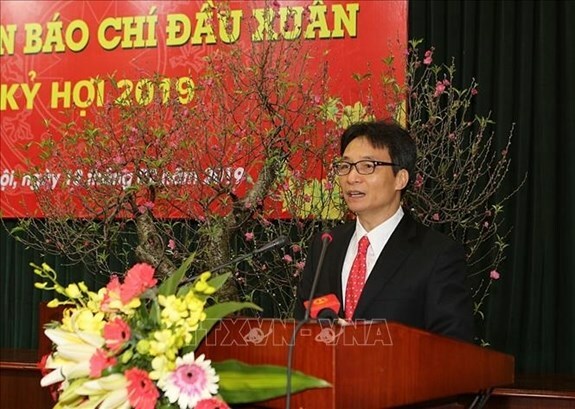 The press should advance its role in developing culture and instigating specific societal changes that reflect positive Vietnamese values in accordance with the Party’s guidelines, said Deputy Prime Minister Vu Duc Dam at a press meeting in Hanoi on February 12. In 2018, Vietnam gained many impressive achievements across a variety of spheres, to which the local press made considerable contributions, the government official said. He added that the press has played an active role in communications, creating social consensus in developing economy, culture, security, defence, environmental issues, and climate change. In particular, press activities in 2018 were conducted in a more disciplined and professional manner, with more lively, illustrative forms of expression, Dam said, adding that the press has also been more sensitive in reflecting social and national issues, as well as environmental matters. He hoped in 2019, the press will contribute more to the building of the Government’s policies and creating social consensus in the implementation of the Party’s guidelines and the Politburo and Party Secretariat’s directions. Deputy head of the Party Central Propaganda Department Le Manh Hung said that in the time ahead, the press should continue to promote the implementation of the Politburo’s directions on the continual learning and following of the late President Ho Chi Minh’s ideology and morality; and the celebration of 50 years of implementing his testament. The press should also cover the efforts in preventing and combating corruption and wastefulness, he added.